Amazon have recently enabled access for developers to send push notifications to users through Alexa. I’ve been waiting for this for months, because there was a particular use case I wanted to work on. The idea is a straight forward one. A person has a button – in this case an AWS IoT button. The button is pressed, and a notification is sent to a specific user’s Alexa devices informing them that help is required. Notifications such as this one aren’t sent to a device, but to a user, so any device that is bound to that account will activate when the notification is sent – making the notification more accessible than having to have your phone nearby all the time. Push notifications are enabled per skill, and whether or not the alert is audible can be determined per device, so there’s a lot of options. Here’s a video showing a simple example of what happens. Then we’ll start looking at how to wire this up. There are several steps to get this working as expected, and we’ll tackle each in turn. Here’s a high level flow of what we have to wire up. Huh? Push notifications first? Yes, definitely, for this example it’s easier to work back from the end result – as once you have a working push notification, you’ll be able to more easily identify if the previous step in the process was correctly wired up. with the permissions accepted by that user for your skill. We need to ensure the skill can get permissions regarding push notifications. As shown in the image, when you select permissions you receive a client ID and secret. Don’t worry about those yet – they come later. You see that the permission toggle is there – but save isn’t disabled. Your skill can be enabled without the correct permissions. Permissions may not be enabled, they may be revoked etc. It’s too off-topic for this blog post, but ensure you’re capturing errors and handle not being authorised appropriately. Once you have this information, add the Alexa.NET.Notifications library to your project, and add the code below. This code is suitable for a skill working in the US. If in Europe then the endpoint will have to change to NotificationClient.EuropeEndpoint, and you’ll have to add the language appropriate locales (according to the docs the notification should always have en-US). 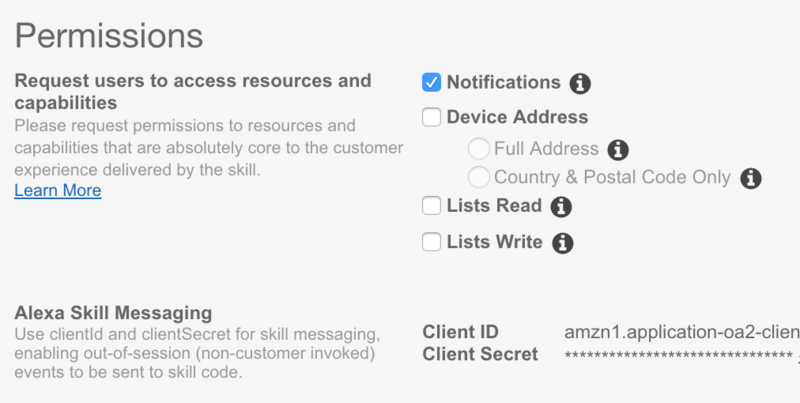 The idea behind Skill Messaging is any internet connected code can send a payload to the Skill Messaging API, a separate API from Amazon, asking for a payload to be sent to your skill on behalf of a particular user ID. The request is authenticated by a token bound to your skill – so if the user specified has that skill enabled then the skill receives a new Request type of Messaging.MessageReceived. The latest Alexa.NET at the time of writing (1.4.2) has the ability to extend the types of request that SkillRequest can handle. When you add the Alexa.NET.SkillMessaging Nuget Package we can add Messaging.MessageReceived support with the following code. For Lambda you add this to the function constructor, if you’re running a Web API then add it to your startup code. The message request should be treated like any other skill request, so returning an empty – but successful – response is fine. 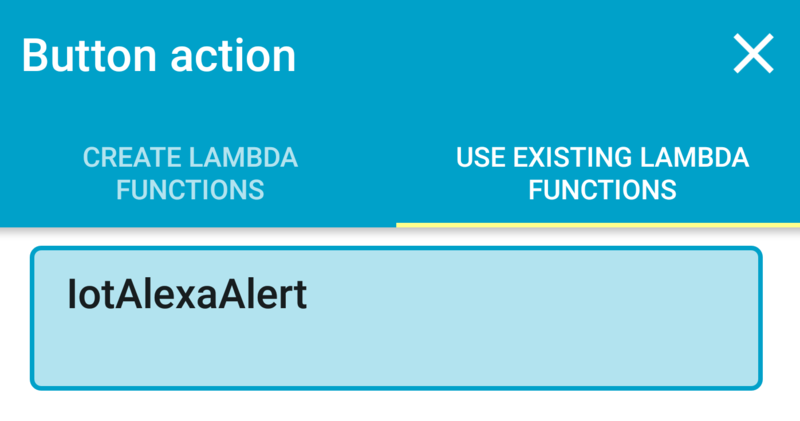 So now we’ve limited the push notifications to valid skill messages – we’ll create a second Lambda function. This one will trigger the skill message whenever it’s invoked. Before we start, a quick word on our use of User IDs in Alexa skills. For this example, I’ll be referencing an environmental variable for the user ID, this is because I only want to send messages to a single user ID – you can find out your user ID for a skill by logging SkillRequest.Context.System.User.UserId in your SkillRequest object from your Alexa Skill when it’s invoked. So as you can see this grabs a few values from the environmental settings of your lambda: The Client ID and Secret you can take from the permissions section of your skill config, we mentioned them earlier. The User ID you grab from your skill as above for testing, or however you plan to map these accounts. The 300 is how long in seconds the message has before it expires. As in our example both parts of this process are lambdas, this doesn’t need to be very high. If you were running it via an API on your own hardware and it might have problems etc, tweak accordingly. Amazon will keep trying the message until it expires or gets delivered. So we have the skill message, and the notification. 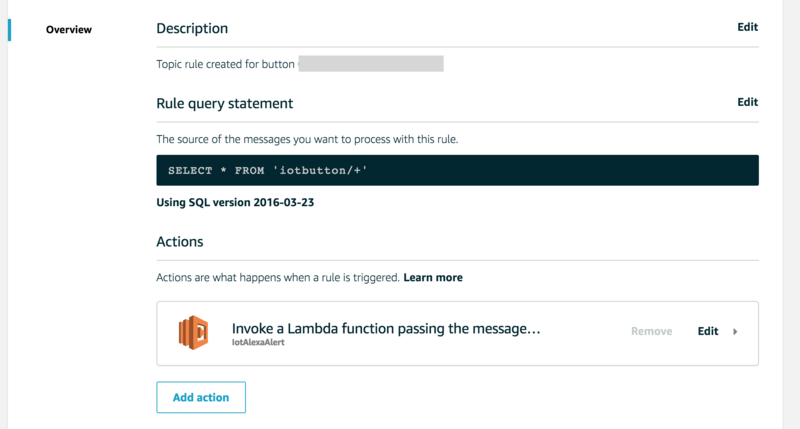 Now the final part of the puzzle – wiring up the IoT button via AWS IoT! When you get the device you’re asked to install the AWS IoT Application from the Google or Apple stores. 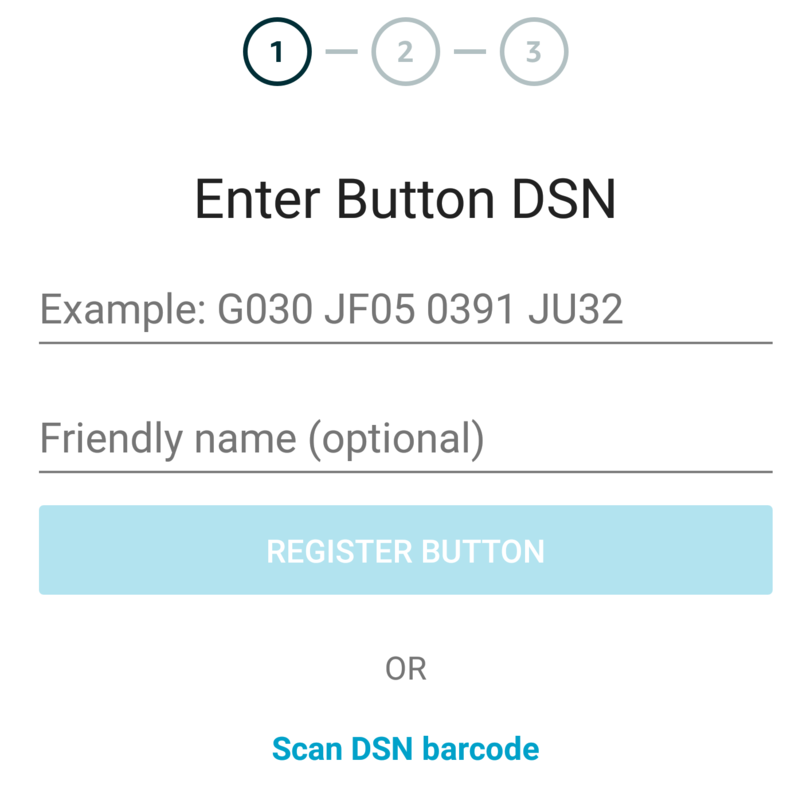 Once you have the app installed, you’ll have to log in to your AWS account and then register your IoT button and link it to the WiFi. As you can see, you can select a list of your existing lambdas, and you just pick the skill messaging Lambda we picked up earlier! I know – I bet you thought this would be the super tricky part, right? I know I did. But Amazon have made all this incredibly easy to get ready. The skill messaging lambda will send a message to the skill, which in turn will actually generate the push notification and sent that to your echo devices. What if you had a button for a specific room, so dependent on the button altered the message that you sent? Remembering that this is all around wifi rather than location – how cool would it be if you had an IoT button that just simply sent someone an Alexa notification “I’m thinking of you right now” while you were at work and unable to talk? What if an elderly relative could press on the button and Alexa let you know they needed you to grab some shopping for them? How incredibly hard can it be for someone struggling to dial and say “I’m lonely”? How much easier is it to just press a button and have that message sent without having to try and form the words? …could they maybe just press a button instead?